Clarymist also known as Eye Logic is a liposomal eye spray that is sprayed onto the CLOSED eyelid – which makes it particularly useful when drops are inconvenient or uncomfortable. The spray can also be applied when wearing eye cosmetics. Just hold the spray a little further away than usual from the closed eye, this ensures it will not ruin your makeup. Hold the spray about 10cm (4in) from your closed eyes. Spray once or twice onto each closed eye for instant dry eye relief. 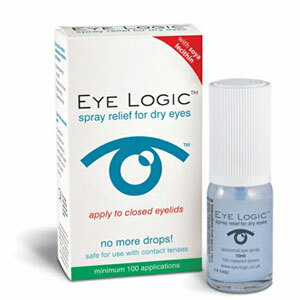 Eye Logic eye spray is fast and effective and there’s no blurring of vision either.